I woke up in the middle of the night thinking about this blog post. And to be honest, I thought the best thing to do was to just delete the series and pretend it never happened. I don’t want to play anymore. But I had to go back to my intro post and read it again. This is an exploration. I am hoping to find some answers for myself, and then take actions to secure my own place of belonging. I’m not here to solve this equation for you or anybody else. You have to do that yourself. What I do hope to do is cause you to self-reflect. Possibly my search will give you pause to think and recognize some things about your own life. Then, it’s up to you to take action — or not. The ability to see, hear, or become aware of something through the senses. A way of regarding, understanding, or interpreting something; a mental impression. Synonyms would be words like: thought, belief, impression, notion, grasp, consciousness, understanding. On that day, over that cup of Americano, I tried to speak empowering words into the life of my friend. I suggested ways to help her change her self-talk. I listed all the things she does well. I spoke of the people who love and admire her. I spoke to her about God. From the groundwork I laid the first few days of this series, you know that I am a Christian woman. And I believe that only God can heal some of our wounds. We have scars from childhood. We’re all damaged from high school. No one comes through their past unblemished. But God’s Word offers promises and blessings over our lives. Sometimes we think we aren’t enough simply because we don’t believe. I challenge you, if you are a believer, to trust God at His word. Do we believe God? Then let’s act on that belief. Believe. Trust. We are enough. That said, along with His Word, I think God sometimes chooses to use really good counselors to help us find our way. We can’t put a bandage on a festering injury. There are times when the wound must be re-opened and cleansed. We need to discover the source of the harm. Then complete healing takes place. Maybe it’s time to call a pastor. Maybe a counselor can help guide us. Maybe it’s time to pick up the phone and call for help. But for right now, we need to know that we are enough. We are enough because we are created in His image and He has good work for us to do, and He has given us the abilities to do them. And because of that work, I belong. 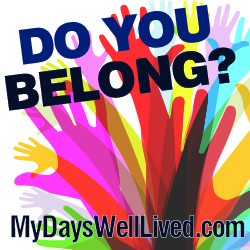 And you belong.